Till the release of Barfi! it had seemed that Ranbir Kapoor and Priyanka Chopra would be the most notable factors associated with the Anurag Basu directed film. However what has turned out to be a pleasant surprise indeed is the presence of Ileana D'Cruz who has managed a very good Bollywood debut. An experienced actress from down South, she has reinforced her standing in the industry and has announced loud and clear that she is here to stay. Even as she continues to gain accolades around her performance in the film, Ileana gets into a tete-a-tete and reiterates the confidence she had in the film. Ileana, you have managed to make everyone stand up and take notice. In fact it was good to see that the film was actually narrated from your point of view. See, when Barfi! came along, I knew that Anurag (Basu) was there to keep it all together and he would pay good attention to every aspect of the film. I knew that I wouldn't be insignificant to the film. In any case, I didn't expect something like typical like 'naachgaana' and all with the film. Yes, I was apprehensive about how people would have wanted to see me for the first time in a Hindi film. However I just went by the flow. (Smiles) For me more than anything else, just acting in Barfi! turned out to be a fabulous experience. In any case it was more or less a given that I would end up entering Bollywood at some point in time or the other. I didn't know when but it was due for sure. I had a couple of offers but they didn't seem right or worth pursuing. 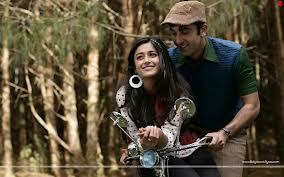 I couldn't have given my time to those films but when it came to Barfi!, I pretty much allowed myself to jump into it. Well, this too was as unconventional a Bollywood debut as it can get for an actress, isn't it? More so since you not just play a married woman but also traverse from being a 20 year old to someone in her 60s. All the nervousness that I had before starting the film vanished as I started interacting with Anurag more and more. Whether it is Ranbir, Priyanka or me, he knew the characters played by us all inside out. All we had to do was sit with him and rely on what he had to explain. And to think of it, we didn't even have a written script to begin with. (Laughs) Anurag used to say that since it was all in his head, we didn't have to bother about the written word. From the world of South to something like this in Bollywood, it must have come as a shock, isn't it? (Smiles) Not really a shock but then the thing is that out there in South, we are used to going through things which are scripted and all we have to do is be on the sets and deliver. Barfi! was a completely different set up. I guess due to this way of working, we all were all the more involved in the very execution of the film and got to know each other much better than ever before. So what happens next from here? I am sure many more doors would have started opening for you in Bollywood now. I just don't want to get carried away now. I could look pretty and do a couple of songs but then that's not the only thing I would want to do in Bollywood. If that was the case, I could have perhaps jumped into the arena much earlier. Yes, I would love to do a glamorous role now but there has to be some meat to the role I step into. One can't deny the fact though that Barfi! has indeed turned out to be big for you, what with the film finding all around appreciation for itself. See, I know that quite a few actresses say that 'working in this film was one great experience' and so on and so forth. However after Barfi! I too have to say the same. The kind of comfortable relationship that we all shared is what made the film special. Moreover this was a very honest set up. There wasn't any guarded approach followed by any of us and we were open about all the things. Yes, at times we couldn't see each other eye to eye but then soon we used to make up and get it right!